Last week included three days of relatively uneventful public hearings on the proposed Belmont Park arena (plus retail/entertainment/hotel) project, which could provide a new home for the New York Islanders by 2021. Most of the criticism understandably concerned local issues like traffic, parking, and transit issues, as reported by Newsday, and supporters talked economic development and jobs (especially union ones). Big picture financing issues, however, didn't get as much discussion, at least according to the media coverage. Both project approval and construction start are anticipated for the second quarter of 2019, which means between April and June. 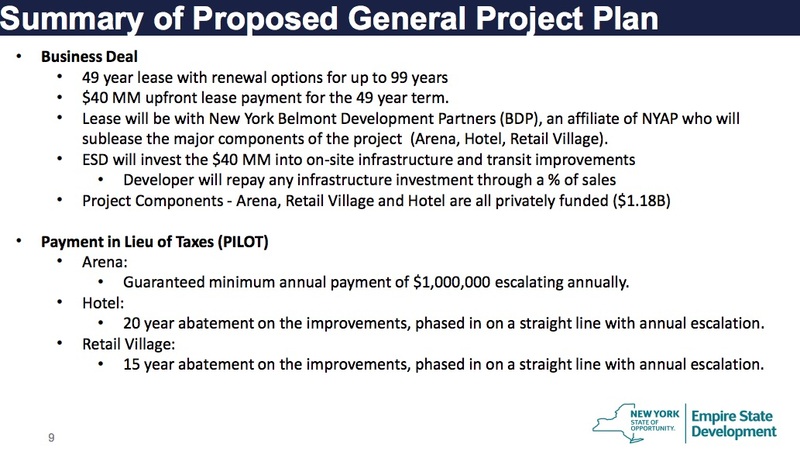 Guess what, the Belmont arena developers' seeming bargain on leasing public land, just $40 million for 43 acres over 49 years, might be a bigger bargain: all the money would be plowed into infrastructure improvements at the site. As a payment in lieu of taxes, the arena developers will pay a minimum of $1 million per year based on attendance at the arena. The retail and hotel components will also contribute to the PILOT, though both are receiving 15-year and 20-year tax abatements respectively. New York Belmont Development Partners, LLC (“BDP” or “Developer”), an affiliate of New York Arena Partners (“NYAP”). NYAP and BDP comprise Scott Malkin Group, Sterling Equities and Oak View Group. Also note that the Draft EIS was prepared by ESD’s consultant, AKRF and its team of subconsultants. AKRF is the "go-to" consultant used on major projects like Atlantic Yards. The issue of potentially costly expanded train service remains open-ended. Williams's op-ed also raised a question: "We asked them about the LIRR station – and all we got was 'we are working on a transit plan.'" Norman--The arena developers have never responded to any of my calls or emails, so these questions remained unanswered. There's been little transparency on this major issue. Estimates from MTA are at least $300M for full LIRR service at Belmont. In a 12/17/18 editorial, Roads and rails are key issues for Belmont hockey arena, Newsday suggested that the developers enlist traffic experts to "provide fresh ideas" to cut down on driving, but said public transit is key. No matter what, they must be flexible once the arena opens in 2021, so they can ramp up if demand outpaces supply. Separately, state officials must not forget the bigger goal: a full-time station at Belmont with service in both directions. To be clear, the MTA is in a budget crisis and has a lot of competing priorities. No one is asking the authority to pony up hundreds of millions of dollars for this right now. But some private investment, or a public-private partnership, could be possible, especially when public transit would help boost the private development. Also possible: a value-capture model in which a portion of tax revenue from the site is used to expand transit. Those are not unreasonable ideas, but Newsday not-so-cautiously suggests that "But Belmont’s redevelopment shouldn’t be delayed by the hope of expanding LIRR offerings there." Belmont Park Racetrack is currently served by a spur to the Belmont Park Station from the Main Line of the Long Island Rail Road (“LIRR”), an operating entity of the Metropolitan Transportation Authority (“MTA”). The spur has manually operated switches that direct trains from the Main Line to the spur. LIRR currently provides a switch operator for the Belmont Stakes and other races during the Spring and Fall Meets, the only times that trains arrive and depart the Belmont Park Station. It is expected that MTA and LIRR will cooperate with BPD in order to automate the switch so that trains can service the station, primarily for Arena events. It is also expected that BPD will contribute to LIRR and MTA funding for the automation of the switches and the operation of the train service. To service Arena events, LIRR is expected to provide two trains operating from the Main Line’s Jamaica Station. ESD will concurrently work with LIRR to explore opportunities for a full-time station to meet the needs of commuters and local residents. ESD and BDP will implement a net lease structure consisting of a single master ground lease (the “Master Lease”), between ESD, as the fee owner of the Project Site and as the lessor under the Master Lease (ESD in such capacity the “Master Lessor”), and BDP as the lessee thereunder (“Master Lessee”). The initial term of the lease is 49 years with renewal options for a total of 99 years. Pursuant to the Master Lease, at closing of the Master Lease, BDP will make to ESD a one-time upfront nonrefundable deposit of $40,000,000 into an ESD account to be held by ESD. ESD will invest those funds for infrastructure improvements that the Developer will make on the ESD-owned Project Site and related mass transit improvements. The Developer will repay any funds used for infrastructure improvements through a percentage of sales on the Development Sites. Notwithstanding the fact that the Project Site is exempt from real estate taxes due to its fee ownership by ESD, the lessee of each Project Component shall pay to ESD, as supplemental rent, PILOT. PILOT shall mean (i) in the case of the Arena, a per event a fee of (i) $10,000 per full event as defined as more than 5,000 attendees or (ii) $5,000 per half-event as defined as 5,000 or fewer attendees (such amount in addition to any entertainment tax imposed by the County on events held within the County). 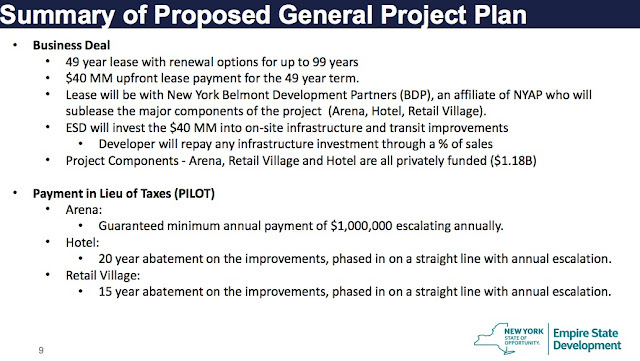 NYAP guarantees a minimum annual payment of $1,000,000 with annual escalation for the Arena; (ii) in the case of the Hotel, an amount equivalent to the actual real estate taxes subject to a twenty year abatement period on the improvements phased in on a straight line basis with fixed per annum rate increases to reach full tax equivalency and subject to subsequent assessments and special assessments; (iii) in the case of the Retail Village an amount equivalent to the actual real estate taxes subject to a fifteen year abatement period on the improvements phased in on a straight line basis with fixed per annum rate increases to reach full tax equivalency and subject to subsequent assessments and special assessments; and (iv) in the case of any other Project Component an amount equivalent to the actual real estate taxes subject to a ten year abatement period on the improvements phased in on a straight line basis with fixed per annum rate increases to reach full tax equivalency and subject to subsequent assessments and special assessments. ESD will cooperate in a sales tax exemption with respect to building materials, fixtures and items related to construction occurring on the Development Sites and mortgage recording tax exemption for the financing of the Project development. A. That there exists in the area in which the Project is to be located, a need for the educational, cultural, recreational, community, municipal, public service(s) or other civic facility to be included in the Project. The Project fulfills several needs of the community, Town, County and region. The Project will create a new gateway into Long Island due to the Project’s central location at the border of New York City and Long Island. The Arena will allow the Islanders to return to their Long Island roots and provide a suitable home for the franchise by providing it with a venue that is designed to meet the NHL’s requirements and is located closer to the people that regularly attend Islander games. More generally, the new state-of the-art Arena will attract new event attendees and provide the necessary capacity and features to host events for the region’s schools, colleges, sports clubs and cultural and community organizations and attract large-scale events such as nationally known music concerts and family entertainment. Creating a new, up-to-date venue for these events will meet an existing need of the Town and the wider Long Island community, generate economic benefits, and promote civic pride. The Project will also provide community facilities space that will be tenanted and programmed for civic and educational uses for the community (e.g., educational and career development). It's not clear to me how this need isn't being met, at least in part, by the Nassau Coliseum.